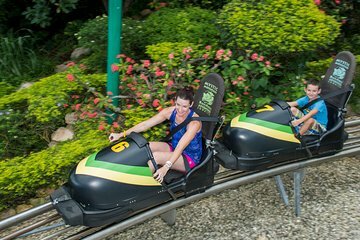 Experimente la maravilla de la selva tropical de Jamaica durante un emocionante viaje en la atracción de Mystic Mountain, Bobsled Jamaica, un bobsled impulsado por la gravedad inspirado en el famoso equipo olímpico jamaicano de bobsled. Además, explore las Cataratas del río Dunn, una cascada de 180 pies (55 metros) de alto y 600 pies (180 metros) de largo, que cae en cascada desde las terrazas hacia la selva tropical de Jamaica. Un tour lleno de actividades ideal para los amantes de la naturaleza y los visitantes por primera vez. Disfrute visitando las cercanas cataratas del río Dunn, una zona en la que se pierden muchas excursiones. We had a blast!!! We will be back when we come to JAmaica again for sure!! If you are going to do the Mystic Mountain tour, there is another one that combines it with Dunns River Falls. Choose that one! Here is why I say that: we were picked up for the tour from our hotel at 8:30 am. After stopping at 8 other resorts, what should have been a 1.5 hour drive ended up taking us 3 hours to get to Mystic Mountain. We arrived at 11:30 and took the sky lift to the top. So cool! You have great views of Ochos Rios and the Caribbean sea on your way up. We got lunch once we reached the top, which was very good! We then did the bobsled that lasted about 7 minutes. After that, we had nothing to do until it was time to go. Because this tour is combined with the folks doing both Mystic Mountain and Dunns River Falls, we were stuck at Mystic mountain until the Dunns River Falls portion was done, which was 4:30. That means we had over 4 hours with nothing to do! There is a pool, but it is small and we got bored with it quick. There are no lounge chairs, only tables, so you can't relax for the rest of the time. You can zip line, but that is still only 30 minutes. We did the nature walk which killed 30 minutes. Bottom line, there is not 5 hours worth of stuff at Mystic Mountain. It then took another 2.5 hours to get back to our resort. We were very disappointed they had so many resort pick up's / drop off on the same bus. We wasted an entire day, the second to the last day we were in Jamaica, for what should have been a 4 hour trip. Pick a different tour that includes Mystic Mountain, because it really is cool. Just don't do it by itself! !